In 1997 , the U.S. Congress enacted a law that directed the United States military services to conduct some of their training programs on Native American Reservation areas. Through a developing relationship, SWIF has served as "gatekeepers" with military personnel in helping appropriate engineers, carpenters, and technicians to work on housing and other much needed projects. We are proud to announce a new building in Gallup where we will be building houses for the homeless twelve months out of the year. We will be building, training, and transporting homes to predetermined homesite locations within a 50 mile radius of Gallup. We can work on three homes at one time. 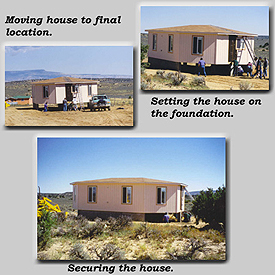 After the completion of the home, we have large doors that open, and haul the homes on trailers to be properly placed. Our sincere hope is to build many homes in the future out of this facility. TheNavajo Housing Authority has given us usage of this facility as long as we continue to build homes. It should go without saying, this is a very expensive program to run. The total cost of building one of our homes is approximately $65,000. Materials,supplies,transportation, and some labor costs are associated with each house. We are indebted to our donors for their generous support. 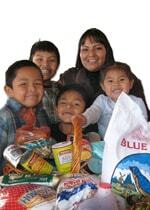 If you would like to become a donor to a poor Navajo family, and support the building of a home, please click on the donation box. May you always be blessed and walk in beauty. SWIF is open to taking volunteers to the housing project, provided the volunteer is qualified to work on the construction site. We don't necessarilyneed journeymen carpenters, but we do want persons that can handle themselves and tools around a job site.